What are the benefits of Kform? 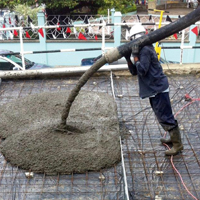 Pour more concrete: Just set out your shuttering and pour bay after bay. Patented design allows concrete to set without any need to use additional expansion joints. Will Kform tip over when the concrete is being poured?? No, the design of Kform is such that the base of the profile is fully loaded in a downward direction before any lateral pressures are exerted onto the vertical section, thus ensuring stability whilst pouring. Does the top strip come out easily after the concrete has set? Do I have to remove the top strip or can I leave it in? Does Kform work as an expansion and contraction joint? The vertical section of Kform is designed to be compressible in much the same way as a fibre or foam joint fillers and in that sense, it will perform as an expansion joint. If the concrete goes into a contraction state, the smooth surface of the Kform will naturally de bond from the concrete and allow it to pull away. Due to the many factors which affect what is required of an expansion joint, the function of Kform as this joint is something that should be designed by the slab design engineer. What bay widths are recommended? The width of a bay is dependent on many factors, the first is the width of the levelling bars that are being used as obviously the bays cannot be wider that the levelling bars. Secondly, the bay width is dependent on the expansion and contraction joint frequency that is required which as above is for an engineer to design. Will Kform rot down in time? 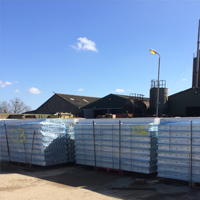 Kform is manufactured from recycled PVC window frames which have a huge lifespan which is in excess of 50 years. This means it will outperform fibre board joint fillers which actually have a very limited lifespan before they rot down. How do I mount Kform onto my formation hard-core base? 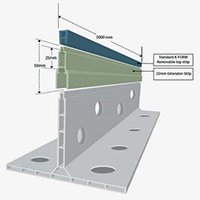 Each Kform rail comes with 4 pairs of holes pre drilled into the base section, Kform is designed to be mounted on mortar or concrete in either individual spots which coincide with these holes or in a continuous bed along its length. This bedding material allows for the Kform to be adjusted for finish height very accurately. How many K25 riser sections can I fit to Kform screed rails? Kform has been tested for use with up to 2 X K25 riser sections added which will give a total profile height of 195mm which allows for a bedding material thickness of up to 30mm which will allow for a 225mm or 9 inch slab thickness. We have however regularly seen people using 3 X K25 riser profiles with no problems at all. What comes with a rail of Kform when I buy it? When you buy Kform, each rail you purchase will come with the main rail profile, a length of top strip to suit and the required jointing clips. For K135 we include 2 joint clips per rail and for K85 and K35 we include 1 clip per rail. Does Kform withstand extreme temperatures in storage and use? Kform is manufactured from the same material as PVC windows which are designed to withstand extremes of temperatures. The PVC will retain 90% of its rigidity at 80 degrees centigrade which is hotter than any ambient temperature in the world. In extreme cold temperatures, it will become slightly more brittle when it is exposed to lower than -20 centigrade but this will not affect its performance in reasonable use. Once the Kform is installed into a concrete slab, the temperature fluctuations become almost negligible as the Kform is protected from the ambient temperatures by the slab so there is no dangers at all. Should I put the top strip as a level joint to the main rail? Best results are achieved by slightly offsetting the joint of the top strip to the joint of the main rail, this gives a perfectly straight joint all the way along the slab. In the same way, it is a good idea to offset the joint of K25 risers from the top strip and the main profile to increase rigidity. The offset can be as small as 20mm or as much as 1500mm and will work perfectly. Can Kform withstand the load of the joint in a slab? 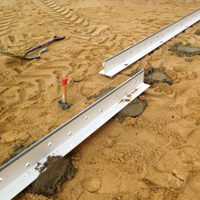 What tools and equipment are required to lay K-Form screed rails? 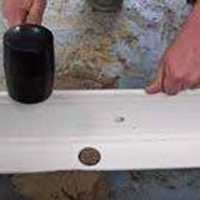 No specialist tools are required, levelling the screed rails with a rubber mallet is suggested. Is the K-Form system suitable for use with mechanical screeds? Yes, all types of power screeds are okay to use with K-Form. 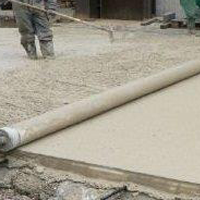 (Roller screeds, Vibro-Strikes, Twin Beams, etc..) K-Form is strong enough to handle all types of levelling equipment. What concrete slab thickness is K-Form designed for? Is K-Form available in 250mm? No but but it can be raised on its mortar bed and attach two of 25mm extensions to achieve the same result, subject to engineer approval. 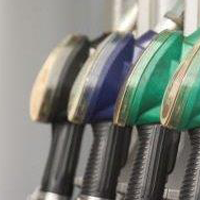 Yes - Unlike foam or fibre expansion material, it is resistant to petrol, diesel and oil making it suitable for forming concrete slab at filling station forecourts, industrial sites and agricultural applications. Does it move when pouring? K-Form stays in place without backfilling or holding with stakes. The bottom base of K-Form acts like a lever when the concrete is placed on top of the bottom flange. It will not shift side to side or tip over. Where can I buy K-Form? You can buy K-Form all over the UK, and select distributors around the world. Please click the contact us tab on this website and someone from K-Form will steer you to your nearest merchant. What is K-Form made from? 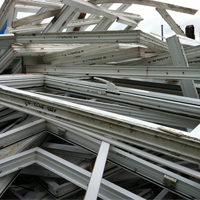 K-Form is made from 100% recycled UPVC sourced from landfill diverted used window frames.